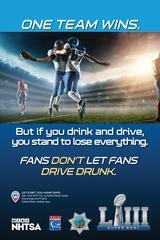 Sheriff's Deputies will be conducting additional DUI patrols on Super Bowl Sunday. Say no to impaired driving. No matter who you're rooting for on Super Bowl Sunday, the San Diego County Sheriff's Department wants to remind everyone about the dangers of impaired driving. Watch for increased DUI patrols by deputies across the county beginning on Sunday, February 3rd at 3:00 p.m. and lasting through 5:00 a.m. the following day. Remember: impaired driving doesn't just refer to alcohol. It can also include marijuana and prescription drugs. "There is simply no excuse for impaired driving," said Sheriff Bill Gore. "One bad decision can end in tragedy." In 2018, 1,183 people were arrested for impaired driving by Sheriff's Deputies in San Diego County. That's down from 1,225 arrests in 2017. Funding for the Super Bowl DUI enforcement program was provided by a grant from the California Office of Traffic Safety (OTS) through the National Highway Traffic Safety Administration (NHTSA).